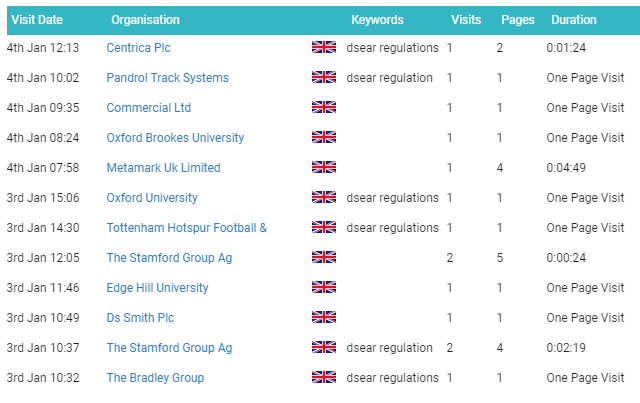 Whether you use the daily companies visited report, or log directly into the A1WebStats system, you will see details of identifiable companies that have visited your website. Totally free website visitors data for 30 days. The offer of free assistance from our website success experts. So what do you do with that information now? If a company has visited your website, and even though you can’t usually identify the name of the person from within that company, if their movement through your website implies a level of interest, then it makes sense to try and find a way to capitalise on that. It’s very typical that a visiting company will have been to more than just your website and even in cases where they preferred what they’d seen on competitors’ websites, you do still have a limited window of opportunity to try and gain the potential business. In other words, they will buy from someone and even if they didn’t make contact with you (because your website may not effectively reflect the quality of what you offer as well as a competitors’ website does, or because they’re not yet ready to buy from anyone as it’s too early in the buying process), then that’s a warmer lead than any other form of marketing you may be focused on at the moment. So whether you personally think that people see such visitor tracking as being ‘Big Brother’ or ‘Creepy’, it’s legal and, as so many of our subscribers will confirm, the winners are those who find ways to link a company name to individuals within that company, but doing so in a way that is sensitive and intelligent. 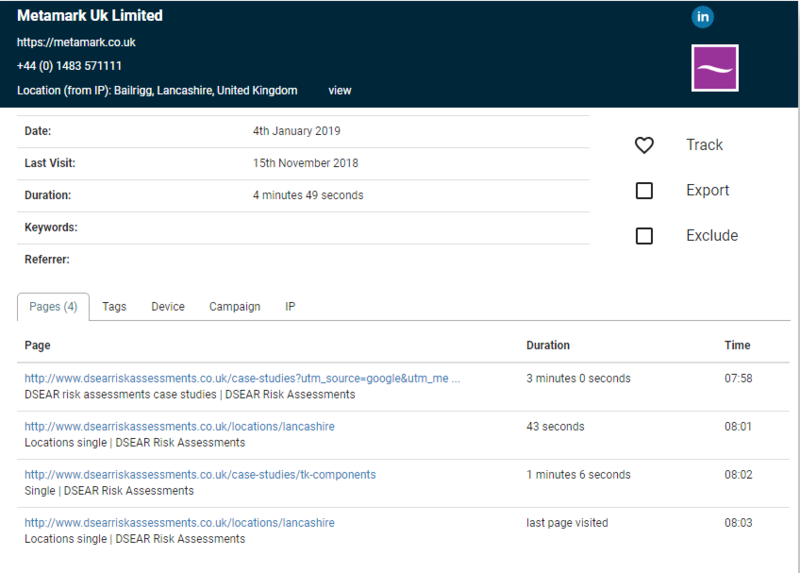 Tracking and then contacting companies that have been to your website is a bit like someone looking in your shop window (your website), not being ready to engage/not being impressed enough, and walking away, followed by the shop keeper (you) running after them down the road to see what you can salvage. Therefore, although A1WebStats does give you the opportunity to try and salvage something from that company visit, the majority of the A1WebStats system functionality is designed to help you make positive changes to your website and the way it’s visible online, so that those companies have more reason to ‘enter your shop and speak to the shop keeper’. Which people from companies have visited my website? Regardless of our view that it’s better to focus on website strength, than it is to chase companies that have been to your website, many of our subscribers use A1WebStats purely to see which companies that visited their websites. Every business is different in their approach to potential buyers. At A1WebStats we have spoken to thousands of businesses and it’s clear which ones win and which ones don’t have the required mindset. The quickest route is to pick up the phone and call the company, asking to speak to the person in the department that you think best matches the interest in your website pages. It’s advisable to first of all use LinkedIn to try and identify the name of the most relevant person rather than being asked to be put through to a department. Good Morning/Afternoon [Name of person], I’m [Name] from [Company] and, being a proactive company, we identified that someone from [their company name] visited our website yesterday. I took a guess that it may have been you but could equally have got it completely wrong! Just for information, the visitor seemed to be mainly interested in [give details of the products/services they seemed interested in]. At this point there’s a natural pause for the person in the company to consider what you’ve said and what you offer. If it wasn’t them, then they may be able to pass you onto someone else that it could have been, or supply you with an email address to send through an introductory email. It’s not uncommon for people within companies to completely deny that anyone from that business would have been visiting your website. This is sometimes defensive (they don’t want to admit it) and sometimes is just being unaware that someone else within the business would have been visiting your website. The larger the company, the more likely that people don’t communicate well with each other. If you can’t get through the gatekeeper, then they may still give you an email address that you can send an introductory email to. Based on discussions we have with our subscribers, there are huge successes gained from picking up the phone. We even have some subscribers who keep the A1WebStats system open all the time, identifying visiting companies and ringing them within minutes of them being on their websites. The recipients of such calls are usually impressed that the potential supplier is being so proactive, which often leads to business being gained. They’re the right person, or they know the right person, and they’re impressed at the proactivity, which furthers the conversation. They’re the right person, or they know the right person, and they’re totally freaked out that you’ve tracked their company visiting your website, and they don’t like it. They haven’t a clue what you’re talking about, are probably the wrong person, or are pretending that they don’t know anything about it. Most people within companies are on the receiving end of endless sales pitches for products or services. They are also accustomed to poor customer service. Some of those people you will never win over. However, for many of them, to receive a proactive phone call, related to something that they, or someone they know within their business, has been interested in, and even if they didn’t like your website that much, they’re going to see that as standing out from the norm. So what can you do when you’ve identified a larger business has been to your website and it’s feasibly numerous people that you should be speaking to? This is tough but in reality you’re unlikely to get far from just a phone call and so have to consider some of the other methods here, perhaps utilising a phone call at a later stage when you’re closer to finding the best person to talk to. Make a point of ringing the business when you believe there will be no-one there to answer calls, or at least no-one in the relevant department. Leave a voicemail or a message with the person that answered your call, referring to the fact that you’d like to talk to the person who visited your website recently, seemingly interested in [insert here what the visitor looked at on your website]. Then follow this up during the next day, referring to the voicemail/message left. This method is less threatening than someone at the company feeling as if they’re put on the spot. They may still not return your call or use a gatekeeper to stop you getting through to them, but they will have had time to think and may see your approach as being proactive without too much pressure (i.e. you left a message, giving them time to think). If you don’t have the internal resources, or are uncomfortable with the idea of ringing up companies that have visited your website, then you can consider outsourcing those calls to external providers who make such calls as part of their day-to-day work. The word ‘telesales’ often brings up negative thoughts but the more proactive ‘telesales’ operations are much more subtle and if they worked from a script agreed with you, then can often gain better results than you would internally. Subscriber receives the A1WebStats daily companies visited report and clicks through to look at the detail of each company visitor. Subscriber tags/emails visited companies of interest so that trusted people outside the business (e.g. outsourced phone operations) can see them. Those outsourced phone operations work from a script, trying to find a route into relevant people within the companies that visited the subscribers website. For each success they get, they pass the details back. This takes the pain of making calls away from you and into the hands of those more comfortable with the work. You would of course have to consider the best way to pay for such services. We would always recommend setting a small budget to ‘test’ the outsourced resources (e.g. over a week, contacting say 50 companies in that time), so that you can assess what they achieve. At A1WebStats we hear stories of such outsourced resources that are successful, and others that aren’t so strong. It wouldn’t be fair to name them and so if considering this method, the ‘test for a week’ is a worthwhile investment, even if you have to do it for a few weeks until you find the right match. If you know the company name that’s visited then you can use LinkedIn to filter down the employees in that company until you see some that could feasibly have been your visitor. What works quite well is to use the LinkedIn filters to filter company employees down to those that match certain parameters. For example, entering ‘marketing’ into the ‘Keywords’ or ‘Title’ fields will filter the results to people who match those parameters. Further filtering the LinkedIn results will be particularly useful when the visiting company is larger. It probably wasn’t you personally, but we picked up that someone from [your company name] came to our website [website name] on [date] and looked at our pages about [details here]. Would you know who that could have been as I’d be interested in talking to them? That text could be cut and pasted in easily, tweaking the editable parts as necessary. Realistically, the hit rate you’ll get is still only going to be perhaps 1 in 10, but if you create a standard process that anyone can undertake, then it doesn’t have to become a job that takes up your own time – and the outcome could be highly beneficial. Obviously, you could of course instead directly connect with/contact the people you find on LinkedIn but, being a more direct approach, it’s not as subtle as the approach above. Other ways of utilising LinkedIn would be finding contacts within companies and slowly ‘nurturing’ them (e.g. responding to comments they’ve made in LinkedIn groups so that they get to know who you are). Another option is to see if your LinkedIn connections are connected to people in the company that has visited your website. It’s possible (although rare) that a conversation with your connection may get you a ‘foot in the door’. Any identifiable company where someone has visited the A1WebStats website, seems to be interested in our service, but hasn’t signed up for a trial, gets an email from us. This is typically when it’s not been otherwise possible to make contact in other ways (for example, having tried via LinkedIn but getting no positive response), so would usually be a few days later. In our case, if the company website shows someone in a marketing or sales role, including their contact details, then it may go to them but otherwise it would go to the generic email address, asking to be passed on to the most applicable recipient. If there is no useful information at all, then a website enquiry form can be completed. The message itself is friendly and basically refers to the fact that we’ve identified that someone from the company visited our website and seemed interested in our service. That’s followed by reference to the free trial available, while also reassuring the recipient that their details have not been added to a mailing list. By creating an email template that can be edited to personalise it in a few ways, it would take you a minimal amount of effort to contact any companies that have visited your website in the previous day. Of course, there are no guarantees of response but, based on our experience, it’s a strategy worth considering. Even if you only got a 1 in 10 success rate, that’s better than nothing. You will have your own preferred methods to try and bridge the gap between knowledge that a company has visited your website, and an individual that you’d like to be speaking to. Some people respond ok to a direct contact (e.g. a phone call), whereas others (the majority, in our experience) would prefer a less ‘threatening’ approach. Identify companies that have visited your website, focusing on those of most interest to you. Use LinkedIn to identify individuals in the organisation, filtering them down to people of interest. Go to the profiles of those people of interest. Leave it a day to see if anyone comes back to your LinkedIn profile, or comes back to your website from that company. Make contact if appropriate. Send an InMail, email, or website enquiry form trying to reach out to the right person, using a templated but edited message. Follow up the electronic contact with a phone call referring to the electronic contact – typically a couple of days later. It’s particularly important to measure results from the approach you choose to take as there will be benefits in refining the process, based on results you do or don’t get.